Determining how much it costs to buy, own, and operate an aircraft isn’t just about the initial purchase price. There is much more to consider, including things like maintenance, hangar costs, insurance costs, any loan costs you may have, or anything that breaks and needs to be fixed on the aircraft. This doesn’t even take into consideration general wear and tear on items, reserves for components that will need to be replaced over time, or the cost of fuel to fly. These other costs are things that many buyers forget, and it costs them later. In addition to actual dollars cost, it can also lead to less flying or even an unsustainable aviation future. It is easy to get excited when we find an aircraft our budget will allow us to purchase, but before you take the leap and write a check, transfer the funds, or get a loan, you should take the time to carefully consider what the real operating expenses of the aircraft will be and if they are justifiable and logical. To assist in this process, I have created a basic personal aircraft operating cost calculator that you can use to compare characteristics and considerations of costs associated with both fixed and variable costs of aircraft ownership, maintenance, and operation. When calculating a real operational cost, there are two major types of costs to consider. Storage Costs – Hangar or tie down costs need to be considered when calculating the real hourly/yearly cost of operation for an aircraft. This may even include utilities if they are billed separately. Insurance – If you are going to have insurance on your aircraft (yes some people do make the decision to go without it, although this is probably not possible if there is a loan on the aircraft) this will be a fixed yearly cost no matter how many hours you fly. Yearly Maintenance – An annual inspection is a yearly cost that is required no matter how many hours the aircraft is flown, so for the purposes here this should be considered a fixed cost. Don’t just ask what the ‘base price’ is for an annual on a particular aircraft. Find out what realistically is experienced by most customers who have annuals done on similar aircraft. There will almost always be something beyond just the basic due to age, wear, and tear on the aircraft. Loan Costs – If the aircraft has a loan or even if you just want to consider the initial purchase price of the aircraft over time, this is a fixed cost that should be considered when contemplating the real aircraft hourly/yearly cost to the owner. Not sure what a loan cost might be? Click here to use a Bank Loan Calculator tool to come up with a value you can use. Variable costs are those that will change on a yearly basis depending on how many hours the pilot operates the aircraft. Variable Maintenance – Things like oil changes, hourly engine reserves, considerations of avionics or other systems wear and tear reserves are variable based on the number of hours flown. Variable Operating Costs – The biggest of these is the fuel cost. Again, less flying results in less yearly cost, but it also means that the fixed costs are a bigger percentage of the hourly cost. Considering a realistic hourly fuel burn (I typically consider this at a low-efficiency cruise) and a realistic cost per gallon of fuel you expect will result in conservative calculations. Bringing the fixed and variable costs considerations together can allow an owner to properly consider what a real hourly and yearly expense might be when owning and operating a particular make and model of aircraft. Without fully considering all of these, the result will be an owner that begins to encounter more and more expenses they had not planned on incurring. In many cases, this results in the owner parking the plane and not using it, needing to sell it, or worse, in some cases having a foreclosure by their loan holder become necessary. Considering these costs ahead of time will allow a potential aircraft owner to determine if a particular aircraft is really in their budget, not just whether they can afford to buy it, but what their real operational budget will be. For many potential owners, carefully calculating this will result in buying a less complex, less expensive to operate and maintain aircraft, that still serves many of their needs or desires. Multi-Engine Aircraft have at least double the expense but don’t double the efficiency of operation. They have more complex systems, more of them, and burn more fuel. In many cases, they only go approximately 30% faster than a comparable single engine aircraft of the same size, so you are at least doubling your cost of operation for less than the same percentage of increase in efficiency. Unless you are considering a bigger and more complex aircraft for purposes of load hauling capacity or another specific consideration, it may just increase your operating cost without gaining any other significant efficiency. Only major jumps in speeds are worth upgrading to achieve. 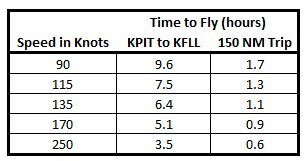 You can see that unless there are major jumps in speed, the differences from each level of aircraft speed is minimally incremental. Consider this carefully if you are going to upgrade ‘for speed’. Unless you are doing very long trips regularly, the math typically doesn’t prove cost effective. Simple planes get more use typically. The more complex, expensive, and maintenance intensive the aircraft, the more likely it is going to break and be down for maintenance when a pilot wants to use it. Simple aircraft such as the Cessna 172 and Piper Warrior offer some of the best dispatch reliability and operate at a cheaper per hour cost. Considering this, it is more likely that a pilot who is budget conscious will fly these more hours per year than a more expensive per hour aircraft. More hours flown per year equals lower per hour cost. An aircraft that is flown more hours per year is spreading its fixed costs across more hours and as a result, it has a lower ‘per hour’ operating cost. Certainly, the variable costs go up on a yearly basis when the aircraft is operated more, but the ratio shows that an underutilized aircraft is many times more expensive per operating hour than a pilot may be able to rent an aircraft instead of owning one. Renting can be cheaper than owning. Taking the time to calculate the realistic per hour operating cost you would experience on an aircraft can help you determine if you should really be purchasing an aircraft. From a purely mathematical perspective, if you are going to fly few enough hours per year that the cost of a personal aircraft per hour would be more expensive than you could rent an aircraft to accomplish the same goals, you probably shouldn’t be purchasing an aircraft. If you still want to own an aircraft when this math is the case, it is a personal decision because it is the plane you want, you don’t want to share, you are looking for a tax deduction, or it is a convenience decision. There is nothing wrong with any of these, but it is a decision you should make based on valid calculations instead of on a guestimate or an emotional decision of how cool you think it would be to own an aircraft. If you are considering purchasing or upgrading aircraft, consider these things carefully, do the math, and be honest with yourself. If your budget is not limited, feel free to shoot for the sky and buy whatever you want, but do it with the knowledge of what the real expenses are going to be. If you have limits on your budget, consider what you realistically want to spend, and find an aircraft that stays within that budget based on all of the above considerations. Doing this will allow you to enjoy an aircraft longer and with more use than if you find it is costing you more than you expected.